Fatima Al Qadiri, as Shaneera. 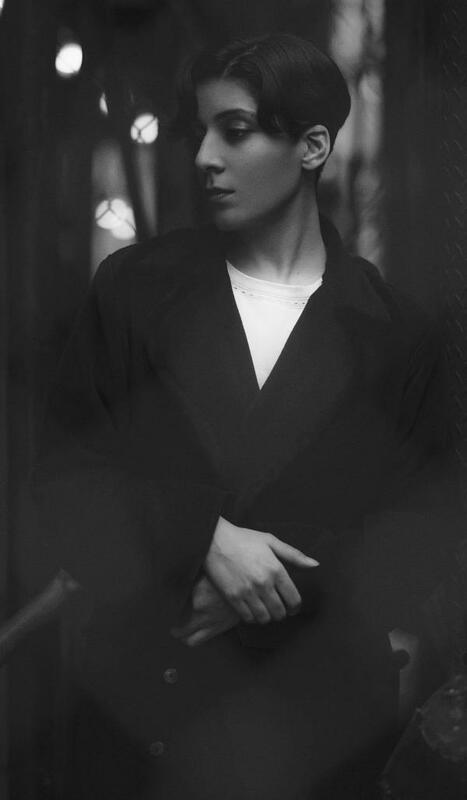 Fatima Al Qadiri, as Fatima Al Qadiri. Shaneera is the latest incarnation of the Senegal-born, Kuwait-raised and Berlin-based U.K. bass producer Fatima Al Qadiri, a fascinating, often arch and wildly original artist who architects sound into concept-driven albums that bang as hard as they thoughtfully explore social theses she has, at least partially, retrofitted for the dance floor. For the last six years, these have revolved around the idea of the inexpressible – the what's-lost-in-translation – via sonic sleights-of-hand. Take Brute, a debilitating album that looked to recreate the specific, ineffable agony of mass cultural outrage toward law enforcement by sampling the exact type of sound cannon that police in Ferguson, Mo., used to control rioters. Asiatisch, released a year prior, presented an "Orientalist's vision of China" through made-up Mandarin phrases and clichéd pan-Asian chords. Her first EP, Desert Strike, managed to simulate the terror of Operation Desert Storm by reconfiguring the sound effects of a first-person shooter game. Her latest, Shaneera, builds upon pop star mythologies by way of a she-devil avatar, a figure born from drag that works as a meditation on the expression of queer identities in the Arab world. If this all sounds a bit ambitious, that's part of the point. Her artist statements map precise parameters onto the scope of each work, claiming narratives and establishing firm intent in an act that's more manifesto than press release. Though knowing the exact premise of each album isn't necessary to get a sense of her work's depth, there is something admirable, maybe fundamental, in her control of electronic music's bottomless well to illustrate her meticulously-wrought narratives. Her albums' droning, doppling textures — all so ownably, blatantly Al Qadiri's — muddle the distinction between club and theatre in a mode that's consistently larger-than-life. Al Qadiri and I saw one another in passing three times over the course of a weekend in Durham, North Carolina, where I found the seriousness in her work checked by the fact that she is hugely goofy in person, laughing easily and musically, with a habit of tending toward pretty, poetic detours blended with a permanent interest in – what she terms - "glibness and bulls***." "C***block has always one of my favorite words in English," she says musingly, mid-way through a heavy-minded lecture titled "Non-Western Perspectives in Western Music Media," during the electronic music festival Moogfest. "Because I haven't heard a word in another language that more accurately — or, really, more beautifully — describes what a c***block does." This is a classic bit of Al Qadirian dialogue: indulgent, austere and obsessed with the overlooked. When she speaks, it is often about language itself, chronically invested as she is in its decomposition and abstraction. Part storyteller, part theoretician, she's the Scheherazade of the electronic music world, chaining narrative and ideas together in the creation of her own universe. On the final day of the festival, we met in an airy hotel restaurant in the heart of Durham. Dressed like an elegant newsboy visiting from the future (shin-length duster coat, ready-to-wear cottons from her friend, Telfar Clemens, and a tiny pair of sunglasses settled midway down the bridge of her nose), Al Qadiri delivered esoteria like a punchline, while destroying a glossy steak. She bloomed in response to questions which allowed her to spin yarns that stretched into symphonies of pop philosophy and personal narrative. The following interview and has been edited and condensed. What did you originally find so enticing about electronic music-making? It was the cheapest and easiest way to access and exercise a method of composition. There was an itty-bitty Casio keyboard in my home in Kuwait growing up, and I used it to make these funny little ditties. It was a baby keyboard, but I was immediately obsessed with its sound. And, each year, with whatever Eid money I had, the keyboard slowly started expanding. It was totally out of necessity and boredom and utility. I also wanted to mimic and re-create the melodies that were coming out of all the video games I was playing — those were my endless fascination. I often think of electronic music as something that's almost overwhelmingly limitless. How did you impose limits, boundaries, or difficulties on the early music you were creating? It was easy — the keyboard itself was limited. There's only so much that you can do with an analog octave. I didn't get into using a computer interface until I was in college, when I forced my way into an elective music composition course, finally had access to a studio and a computer, and, yes, quickly felt overwhelmed by it. I was used to the limitations of composing on an analog keyboard, recording it on cassette tape, then memorizing it, as opposed to the boundlessness of software. I think it was late in the year 2000 that I finally got my hands on a copy of [digital audio workstation and sequencer software] Logic Pro. Honestly, it took me ages to understand how to compose using it. I'm a Luddite, you know? I had no help, and it took years for me to become even semi-fluent in the program. Where do you stand on the idea of an artist's statement? No artists are required to say anything about their music, but much of your work, I'd argue, either comes with or merits a strong one. I think it's about controlling the narrative of your work, which is something I actually want to do. Stating your intent can be important, especially when music is such an abstract language. I have a very clear narrative attachment to my work, and I want to be able to communicate that with some control. Each of my pieces is a short story; my father was obsessed with Rimsky-Korsakov's Scheherazade, and I think my mother, a novelist, was a real-life Scheherazade too. She came from a chain of Persian storytellers. Do you feel kin to Scheherazade as well? Of course! I've always told stories to stay alive. And I love work with such a thematic, narrative bend to it. It's almost a childlike impulse, I think. It's about memory and preservation and legacy. It's why I'm so obsessed with Revisionist History, Malcom Gladwell's podcast. His work discusses overlooked stories that somehow changed the course of history, and I adore the idea of what's hidden right in front of us. You know, I think if you're creating some sort of narrative in an album, it's worth putting it down and trying to articulate it and make it visible for others. Unfortunately, I've done only minimal writing in my day. I've always struggled with English, even though it's my first language, in that I feel like I don't and can never really own it. I think all writers go through their entire lives wrestling with that idea. You know, I wish I could go even harder — even more HAM — with my work, and create a piece that's somehow akin to a short story, where each track is as expansive as chapter. That's a dream of mine. Do you think very specifically about your audience? Either in who you're making music for, or who's checking it out? Oh, no, not at all. That would be stunting. I make everything for myself. It's a big diary — my body of work is just a huge journal. It's a culmination of experiences and months and chapters in my history as a person. It's homage, it's memoir, and ultimately all autobiographical. Tie all these records together, and they each have something to do with periods in my life. Would you say that Shaneera is for everyone, or does that particular EP have a general audience in mind? Shaneera is admittedly different. There's that Arabic language barrier, of course, but having said that, she's found her audience. So many queer, non-Western music producers have gotten in touch with me since the announcement of the record, telling me that it's been a huge inspiration for them to write in their own language. And that really touched me. I finally thought, "God, I've done the right thing." It was eye-opening to see and hear how many producers were holding back for a number of reasons. For fear of tokenization, for fear of not gaining traction, for fear of being misunderstood or stereotyped. Last night was my very first live performance as Shaneera, you know. I was so happy singing in Arabic for that crowd — that was the first time she's come out of me. I couldn't stop laughing at some moments. It was so joyous. It was pure drag! Exactly. What is drag? It's the performance of extreme gender. The thing that's so interesting is that Shaneera's supposed to be a fake Arab pop star. The thing is, Arab pop stars, like many pop stars around the world, are ultra-heteronormative icons. With some exceptions, they represent extreme femininity and extreme masculinity. So it's so accurate to apply drag methodology to the sort of appropriated pop music I'm doing here. I imagine much of your work lends itself to worlds of critical interpretation. Do you feel a degree of responsibility to correct assumptions made of your work? Oh, I literally do it all the time. I don't think many artists do — or admit — that. I do want to say it's a losing battle sometimes, because I get the idea that whatever you put out into the world is honest. But there's sometimes people out there that can be intentionally malicious, who want to change your narrative for their benefit. I can tell the difference between laziness and a hit job — and those people certainly exist. Especially being a particularly vocal woman of color... you know what I'm getting at here. You can be a target sometimes. I've met so many women musicians around the world that refuse to release music for fear of being misinterpreted by white media. And I'm baffled. I'm blown away. This is how crippling the world of criticism can be. It's terrifying, sometimes. It's already tough enough to put something out there and make yourself vulnerable. Everything can be an act of joy and beauty until it gets put out. Then it can get dangerous. Oh man, even for this record, my mother sat down with me and said, "Listen, girl. This record is in Arabic. It's about this subject? I'm going to listen to it, start to finish, and you'll let me censor anything that would be too dangerous for you to include." That sense of obligation and duty to your mother sounds — as far as I can speak to — so endemically Middle Eastern. Yes and no. My mother's extraordinarily liberal — more liberal than other mothers, much less Mid-Eastern mothers, but what she did was right. She's never interfered with my work before, and she lives in Kuwait. If anyone's going to come for my work, they're not going to go after me, they're going to go after her. And she made me remove a few very graphic, sexually-explicit scenes from the album. I had to. Of course I had to! I'd be so undutiful, so ungrateful, if I didn't do that for her. I find that the need to correct "incorrect" interpretations of your work fascinating, especially because your music seems to constantly chase this idea of mistranslation. Have you always been fascinated by failure, or these impasses of intent and meaning? I think so. The thing is, being rootless, and the idea of not fitting in — which I think most people feel — is compounded by that idea. It allows you to look at how things went wrong. It's about hegemony, about power dynamics, about things that are inflicted upon us. I was reading about this concept of "negative hallucination" earlier that might explain this a little better. A "positive hallucination" is when you see something that doesn't exist. A "negative hallucination" is where you miss something that's right in front of you. And I think this is the thing that I relate to most — the negative hallucination as the misinterpretation. Seeing things in front of you and not seeing them. That reminds me of something you'd spoken about yesterday during your lecture on the topic of semantic gaps. At the most literal level, some languages don't have the capacity to understand something so natural in another language, only because its lexicon doesn't accommodate for that idea. I think every language has its own buffet of incredibly concise terminology. That's why learning other languages is so incredible, because they hold ideas that don't exist in the language that you grew up with, the language you natively speak, or the language you've created for yourself. For instance, including the term "queer" in Shaneera's press release really messed me up. There's a lot of terminology for gender in a lot of other languages, but there's no term for queer in Arabic. There's no word for "heterosexual" in Arabic, either. Fixed sexuality, until recently, was a very Western concept. Queer, as a catch-all for this idea of non-binary gender – that's new. So my friends almost edited it out of the press release, because they felt that the word "queer" wasn't exactly true to the album. Ultimately, I left it in. The thing is, Shaneera is a persona. She's as non-binary as they come — she's an evil spirit. An evil, queen spirit that can possess anything. Did you catch the credits that rolled behind me at the end of my show? They were hilarious. So garish. Yes! At the end of every major Arabic pop music video, there are these hilariously long credits. So I used that here — and I thanked Vincent Price, who's obviously a vision of Shaneera, and Bette Davis, Joan Crawford, John Waters, Divine. I thanked a lot of people personally in my life, friends of mine, and obviously some Kuwaiti and Arab references — queers who shall not be named. Can you elaborate on the tension between performing as an artist who interrogates non-Western ideas and as serving, for better or worse, as a de-facto "ambassador" of the Gulf in electronic music? I'm so into the idea of the "nation as an apparition." I think people from across the world have a deep sense of internalized nationalism, an ingrained idea that by coming from a country, you're obligated to represent that country. And the smaller the country, the greater the stakes. To me, it's similar to the idea of superiority; it's a taunting, childlike, territorial idea. It's denies humanity. It's an impulse of media and artists alike. I don't consider myself a part of the diaspora because I'm still so bound to my culture, but at the same time, I'm still at a remove. I left Kuwait for a reason. In that, I think, I have new freedom. I can pick and choose what I want to use – I can appropriate where I came from. Those Kuwaiti drum samples, those Arab sounds, all the work I make — all of those things are mine now. I've claimed them.